The new Prospex re-creation of this 1970 diver's watch is slightly larger than the original but faithful in every other respect to its design. It is, however, completely up-to-date in its technology. It incorporates caliber 8L35 which was specially designed for use in diver's watches. The upper surface of the bezel rim is Zaratsu polished to a perfect mirror finish. This Prospex timepiece is assembled by hand in the Shizukuishi Watch Studio in northern Japan. The case, in stainless steel with super-hard coating, measures 45mm x 13mm. It has a cual-curved AR-coated sapphire crystal and it is water resistant to 200 meters. Movement is the Japanese automatic Seiko in-house caliber 8L35 with 26 jewels, 28,800 vph and a power reserve of 50 hours. Magnetic resistance: 4,800 A/m. It comes on a black silicone strap with a steel buckle. MSRP is 4,250 Euros. 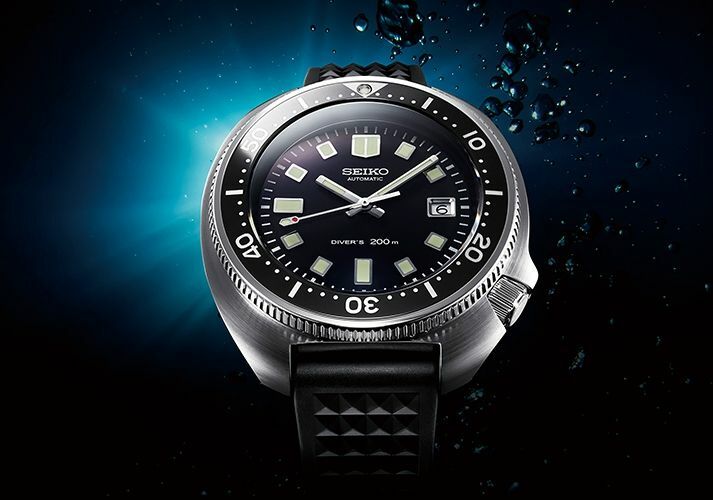 Available starting in July 2019 at Seiko Boutiques.